Not quite a neoconservative, Christie is still sounding a lot like, well, Hillary Clinton when it comes to world affairs. As noted earlier, this is foreign policy week, with President Obama’s big speech yesterday at West Point, and our previous post at Christie Watch where we took the occasion to analyze Hillary Clinton’s own foreign policy record, which we found wanting. Today, we’ll look at Chris Christie’s foreign policy ideas, and tomorrow the others in the GOP 2016 field. Like many governors who’ve sought the presidency—including several who’ve won it, such as Bill Clinton, George W. Bush and Barack Obama—Governor Chris Christie of New Jersey appears to know very little about world affairs, and he has even less experience. 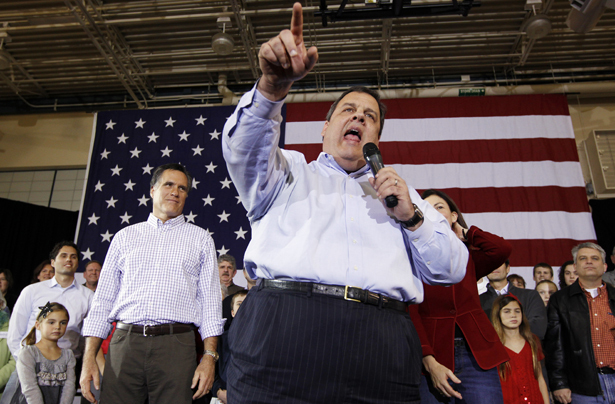 Given that Clinton, Bush and Obama all made it to the White House despite lacking credibility in foreign policy, that’s not necessarily a handicap if Christie decides to enter the 2016 primary field. But what does he know? And when didn’t he know it? The rest of the world watches in desperation and hope that America will realize and act upon once again its indispensable place in the world. … We must lead.… [America is] the strongest moral power for what is good and what is right in the world.… We need to stand once again loudly for these values. And sometimes that’s going to mean standing in some very messy, difficult places. Standing long and hard for those things that we believe in.… We will either lead or disappoint. Those are the only two choices. Unfortunately, today, in my opinion, America is disappointing. But it’s not too late. Who’s out there that you will nominate to make sure that justice is done around the world, that lives are protected, and that liberty and freedom is not only protected where it is but is pushed forward in places where people merely dream of it? Clearly, Christie—who’s actively reviving his presidential hopes in the expectation that he can put Bridgegate behind him—thinks that he’s precisely that person. In fact, Christie has been cultivating an image, if not a detailed foreign policy program, for quite a while now—at least since 2011, when he gave a major speech at the Reagan Library, at the invitation of Nancy Reagan, in 2011. It appears that his views, such as they are, have migrated a bit in the hawkish direction since then, perhaps under the influence of Adelson—and, indeed, to make it clear that Christie isn’t a follower of Rand Paul’s anti-interventionism perspective. You’ll be forgiven if you haven’t read that speech or don’t remember it, but at the time Christie was actively considering either a presidential bid for 2012 or, at least, a slot as Mitt Romney’s vice presidential pick. Back then, he began his remarks by saying that President Reagan’s actions to break the strike by air traffic controllers and destroy that union is an “example” to the rest of the world of what the United States stand for, adding, incredibly, “If President Reagan would do that at home, leaders around the world realized that he would do it abroad as well.” Do what? Break their unions, too? I understand full well that succeeding at home, setting an example, is not enough. The United States must be prepared to act. We must be prepared to lead. This takes resources—resources for defense, for intelligence, for homeland security, for diplomacy. The United States will only be able to sustain a leadership position around the world if the resources are there—but the necessary resources will only be there if the foundations of the American economy are healthy. So our economic health is a national security issue as well. The United States must also become more discriminating in what we try to accomplish abroad. We certainly cannot force others to adopt our principles through coercion. Local realities count; we cannot have forced makeovers of other societies in our image. We need to limit ourselves overseas to what is in our national interest so that we can rebuild the foundations of American power here at home—foundations that need to be rebuilt in part so that we can sustain a leadership role in the world for decades to come. That is American exceptionalism. Not a punch line in a political speech, but a vision followed by a set of principled actions that made us the envy of the world. Not a re-election strategy, but an American revitalization strategy. We can’t pull up the drawbridge that connects America to the rest of the world. That simply doesn’t work. And as we learned to our horror a decade ago, we as a country and a people are vulnerable to terrorists armed with box cutters, bombs, and viruses, be they computer generated or man-made. Out of the rubble and the ruins, and out of the destruction, we were reminded that evil men guided by an evil ideology can do great harm to us; that no nation, no state, and no city is beyond their reach. And so we need to remain vigilant together and be prepared to act together with our friends and allies to discourage, deter and defend against aggressors all across the world against our nation and Israel. The governor invoked the Sept. 11 attacks to criticize those who, like Senator Rand Paul, the Kentucky Republican who is a potential rival for the 2016 presidential nomination, have questioned whether government surveillance efforts have trampled on civil liberties. “The next attack that comes, that kills thousands of Americans as a result, people are going to be looking back on the people having this intellectual debate and wondering whether they put…” Mr. Christie said before cutting himself off. But yesterday a leading figure in the GOP and someone seen as a formidable presidential possibility for 2016 finally fired back at Paul. Speaking on a panel at the Aspen Institute, New Jersey Governor Chris Christie denounced the effort to pull back on anti-terror measures as “dangerous” and warned that those—like Paul—who are attempting to craft an American retreat from the world are playing with fire. In speaking in this manner, Christie put himself on record as endorsing the policies of President George W. Bush that have been largely continued by President Obama as necessary, and served notice that Paul will be strongly opposed by Republicans who don’t want their party to be hijacked by isolationists. In doing so, Christie not only indicated that he is prepared to run in part on foreign policy issues but may embolden other possible candidates with similar views to his on this question, like Senator Marco Rubio and Rep. Paul Ryan, to do the same. In Las Vegas, Christie ran afoul of the Adelson crew when he used the words “occupied territories” in a reference to the, well, occupied West Bank. (He later apologized to Adelson.) In his New York speech last week, Christie again drew criticism from hardline supporters of Israel by failing to mention the word “Israel” in his speech. But that seems a minor oversight, because Christie, like any prospective American candidate—Republican or Democratic—won’t hesitate in the end to say the usual things about Israel.